Alas, the much sought after Cowboy Caviar recipe. It doesn't get much simpler than this one folks! Cowboy caviar, is probably the easiest dish that I make on a regular basis. T loves it, I love it, everyone who tries it usually also loves it. Most of the ingredients, lucky for you, are things that you can easily stock up on and have on hand for a last minute impromptu gathering. It's a great healthy chip dip for tailgates, backyard barbecues, and super quick to throw together for unexpected guests. There are many things you can use cowboy caviar for. It's a good thing too. This recipe makes 10-12 servings, so if you only have a few people sharing, you'll probably have leftovers. OPTION ONE: NACHOS. Preheat the oven to 375 degrees. Cover a baking sheet with aluminum foil. Brown some hamburger on the stove. Spread a layer of chips on the baking sheet, spoon cowboy caviar over the top, add a little salsa, and the browned hamburger and load up with cheese. Pop it in the oven until the cheese melts - approx. 10-15 minutes. OPTION TWO: SOUTHWEST OMELETS. Load up the inside of your omelet with leftover cowboy caviar and any other ingredients you like. Add a little Mexican or pepperjack cheese and serve with sour cream, cilantro, salsa and green onion if you have it. OPTION THREE: LOADED POTATO SKINS. Preheat the oven to 400 degrees. Bake your desired amount of potatoes for 30-40 minutes, or until softened. Remove from oven and slice in half. Scoop out the middles and brush with butter or olive oil and a sprinkle of paprika. Transfer back to the oven for 6-8 minutes, remove and load up with cowboy caviar and cheese. Bake another 8-10 minutes, or until the cheese has melted. Serve with salsa and sour cream. *NOTE: Adjust jalapenos based on how much heat you can handle. Removing seeds will lessen the heat. Also, if you can't find fresh jalapenos, a small can of them will work just fine - check the Mexican section of your grocery. OR substitute Serrano peppers instead. Chop or dice all of the fresh veggies. Drain and rinse the beans and corn. Combine all ingredients in a large bowl and toss to combine. If it seems too dry, add a little more red wine vinegar. As per request...a glimpse into Lady H's Bachelorette weekend in Okoboji. A view of the spread. For those wondering...we had chili, cowboy caviar, roasted red pepper hummus, homemade chocolate chip cookies, cupcakes, twizzlers, cheese-crackers-grapes, and strawberry water out of the awesome water-dispenser I recieved as a Christmas gift from my mother-in-law. Thanks Mama S! 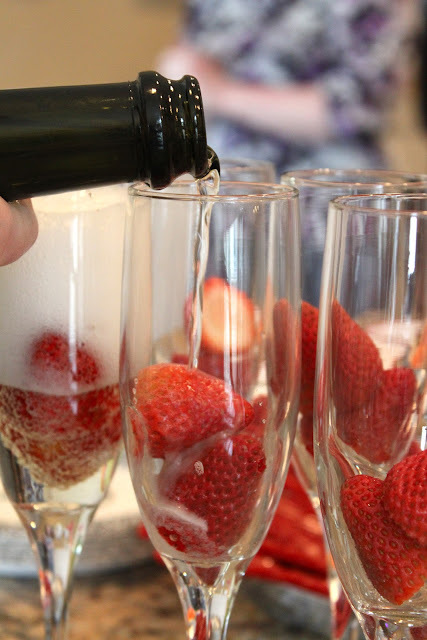 Oh, and lets not forget the champagne and strawberries! I don't often drink champagne, but when I do...it gets classy. 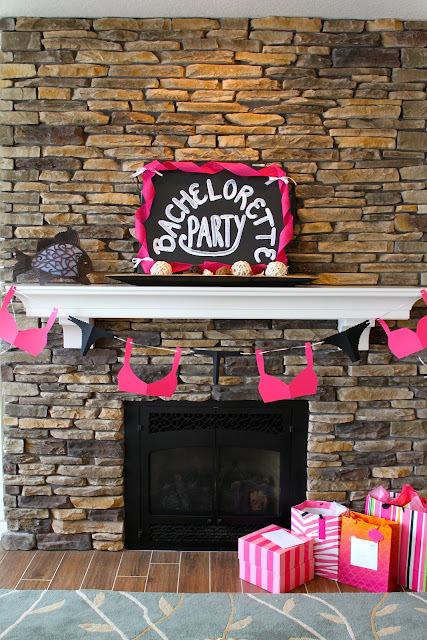 Bra & undies garland and sign made by yours truly. 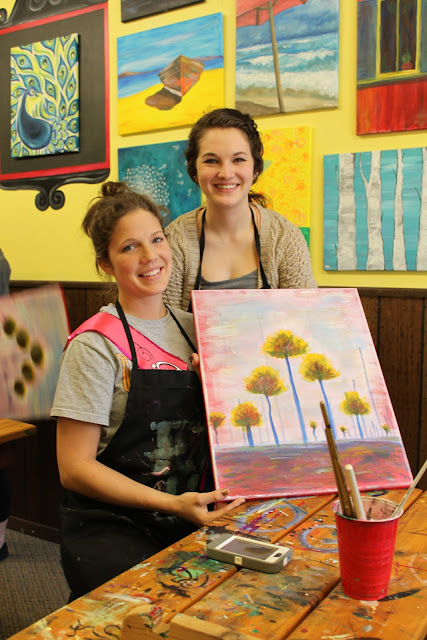 The Bride-To-Be and her Maid of Honor at our awesome painting class at Creative Spirits in Spirit Lake. I highly recommend taking a class with them. We all had a wonderful time! All dressed up and ready to go out for dinner. Doesn't everyone look so nice?! Lady H with her sister H and soon-to-be sister-in-law me! Now we just need a way to photoshop in her other sister-in-law D and we'll have all the ladies! To see more pictures from the day CLICK HERE. Good morning lovers! I hope you all had a fabulous weekend. Mine was filled with lots and lots of fun happenings. 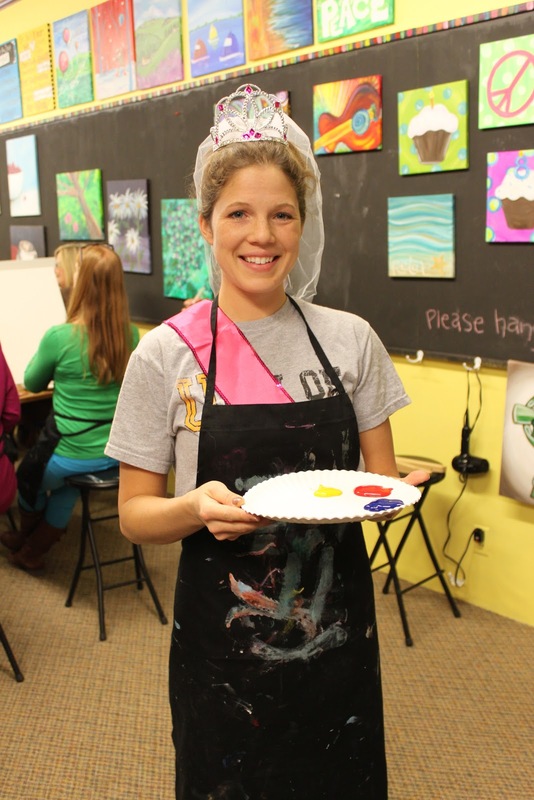 Among them, taking a painting class, a dinner date with some lovely girls, and celebrating at a bachelorette party for my future sister-in-law. LOVE. Another thing I LOVE, are these quinoa johnnycakes. T, who I should mention has no appreciation for, and most definitely does NOT love pancakes or any breakfast food for that matter, even gave these a thumbs up. Take it from me. They are very yummy. Step Two: Cook the quinoa. Allow time to cool before mixing with the rest of the ingredients. Quinoa can be cooked ahead of time to cut down on total cook time. While quinoa is cooking, mix together the wet and dry ingredients to make the base batter for the johnnycakes. Step Three: Mix together cooled quinoa and johnnycake batter. Be careful not to over mix. Allow to rest for 1 hour before cooking. Step Four: Using a 1/3 C measuring scoop, drop batter onto a lightly oiled skillet or griddle. Drop 8-10 blueberries onto each johnnycake. When batter begins to bubble, flip johnnycakes and cook the other side. Step Five: Stack the johnnycakes on a plate, and serve with a dollop of vanilla Greek yogurt, fresh blueberries, and a drizzle of maple syrup. Yum. Yum. Yum. These johnnycakes are not only filling, they are also delicious. Go ahead and freeze or refrigerate any leftovers you have for another time! BLUEBERRY QUINOA JOHNNYCAKES | Yield: 20 pancakes (5-6 servings) | Total Time: 20 min. prep (plus approx. 20 min. to allow quinoa to cool) + 1 hr resting + 10-15 min. cooking = 2 hrs. *NOTE: To cut down on total time, you can make the quinoa ahead of time so that you don't have to wait for it to cool. Any type of quinoa will work. Red just looks prettiest :) Also, if blueberries aren't in season, go ahead an try this recipe with bananas, strawberries, raspberries, or any fruit that prefer. Bring a saucepan with 4 cups water and 1 tsp salt to a boil. Add the quinoa and stir, lowering heat to a simmer, cover and cook until the quinoa is dry and fluffy, about 20 minutes. Let cool. Mix the flour, sugar, baking powder, salt, and cinnamon in a large bowl. Add the milk, eggs, vanilla, and olive oil, whisk to combine. Add the dry ingredients to the wet and blend until just mixed together. Fold in the cooked quinoa. Let the batter rest for one hour. Heat a small amount of olive oil in a large skillet or griddle. Using a 1/3 C measuring cup, scoop batter onto the hot pan. Drop 8-10 blueberries on top of each pancake. When bubbles form in the batter, flip and cook on the other side until lightly browned. Continue with the remaining batter and blueberries. Serve topped with a dollop of vanilla Greek yogurt and maple syrup. Have you ever tried incorporating quinoa into your morning meal? As promised, baked tostones to serve with the picadillo cubano recipe I blogged about this week. Tostones, are not as foreign as they sound. Essentially, they are cooked plantains. Plantains are a very common find on dinner menus throughout the caribbean, and if you ask me, very underestimated in the midwest, or anywhere I've ever traveled in the U.S. - territories aside. That being said, I have begun to see them on a much more regular basis in small quantities at most major grocery stores. You can usually find them close to the bananas. When choosing plantains, the ones that are brown are good to eat, so don't be fooled if they look a little like over-ripe bananas. That's just where you want them. Plantains are similar in taste to a banana, although not as sweet, and have a texture closer to a potato. Green plantains tend to be more starchy, while ripe plantains will be slightly sweeter in flavor. Consider this your warning: they can be tricky to peel. Their skin is much tougher than a banana skin, and may require cutting off rather than peeling depending on your prowess in the kitchen. There are a few ways to make tostones, the typical way being to heat some oil in a skillet and pan-fry them into delicious chips. If you want to go that route, I won't stop you. I've done it, and they are pretty dang yummy. On the other hand, if you are trying to avoid fried food and want a healthy, but equally tasty alternative, these baked tostones may be just what the doctor ordered. Literally. T thought these were amazing, and has been asking me constantly to make them again for a snack. Bake the tostones for an additional 15 minutes after flattening. Allow them to cool slightly and serve warm. They will be crunchy on the outside and soft in the middle. Enjoy! Peel the plantains and slice them into 1/2 inch slices. Put the slices in a large bowl, drizzle with olive oil and salt, toss to coat. Arrange the slices on the baking sheet and bake for 10 minutes, or until slightly brown on the bottom. Remove from the oven. Using a meat mallet, heavy-bottomed glass or jar, or any other 'smashing' utensil you have in your kitchen, mash each piece to about a 1/4 inch thickness. Flip the plantain medallions so that the browned side is up, and bake for another 15 minutes until golden brown and crispy. Have you ever cooked with plantains? A vacation to the Caribbean is many things. Sunshine, ocean, palm trees, sand between your toes...the list goes on and on and on. Something I find myself particularly interested in while on such a trip, are the different types of food found in an everyday kitchen in whatever region I'm traveling. Dishes that may seem everyday there, are new and exciting to yours truly. 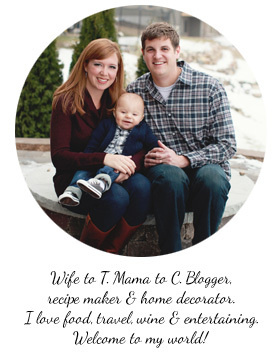 Upon return, I'm always on the lookout for a way to bring that delicious Caribbean taste to my Midwest table. Knowing that I may never visit a recipe's country of origin, it's fun to experiment with international cooking and the different flavors from regions across the globe from the comfort of my own kitchen. Are you up for the challenge? *NOTE: if you come from a family with Latin American or Caribbean background, this probably doesn't apply to you as it seems that some of you out there make this dish on a regular basis. For the rest of you - think of this as an updated Cuban take on more typically American meal - the maid-rite. Gather the ingredients. Lucky for you, this Cuban-inspired dish uses common ingredients that can be found at all grocery stores. Another bonus you ask? This recipe freezes well if you find you have leftovers. PICADILLO CUBANO | Yield: 8 servings | Total Time: 45 min. Brown the ground beef in a large pot over medium-high heat. When the meat is no longer pink (approx. 10 minutes), drain any excess grease from the pan, and transfer meat to a warm plate. Tent with foil. Meanwhile, while the meat is cooking, chop onion, green peppers, tomatoes, garlic, green olives and cilantro. After removing meat to a plate, heat 1 Tbsp olive oil in the same large pot. Add chopped onion, green pepper, tomato, garlic and green olives. Saute until the onions are translucent (approx. 8 minutes). Add the meat back to the large pot, then add raisins, capers, 2 Tbsp olive juice, bay leaves, oregano, cumin, cilantro, salt and pepper. Stir to combine. Bring mixture to a simmer, then cover and reduce heat to medium-low. Simmer for an additional 15-20 minutes. Now is a great time to get that rice going if you haven't already! When ready to serve, spoon over a bed of rice and sprinkle with cilantro. Baked tostones make an excellent side dish to this recipe. What are your favorite Caribbean inspired recipes? Is it just me, or does this winter seem to be draaaaaaaaaaaging on? Over the weekend we celebrated St. Patrick's Day. I can definitely remember some recent years that St. Patrick's Day has been warm enough to be outside in t-shirts with no coats. Not this year, however. I woke up to yet another day with snow falling...and falling...and falling...4 inches of the stuff! OVER IT. In light of this depressing snow-filled day, I decided that a nice light spring tasting meal would be just the thing. 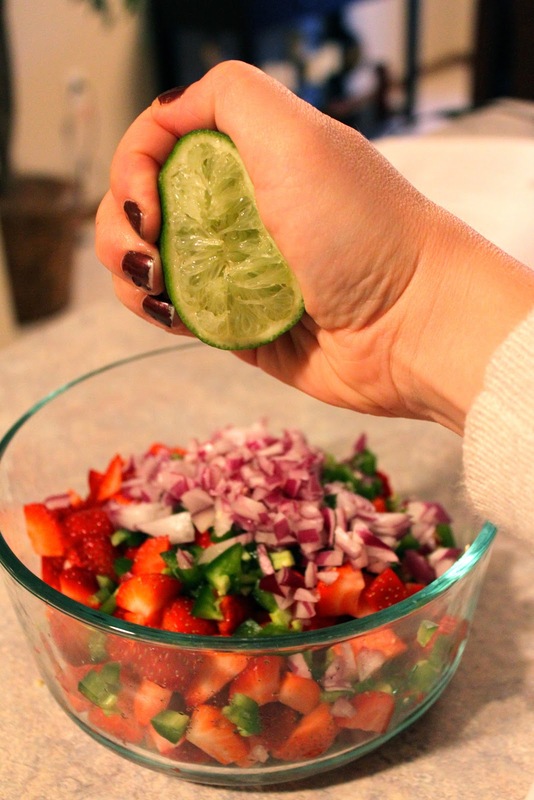 This strawberry-chili salsa is excellent on it's own for a snack with tortilla chips, or to make a meal out of it, spoon it over some delicious roasted chicken or fresh fish for a wonderful light dinner option. *NOTE ABOUT ROASTING CHICKEN: If you are lucky enough to live where you can grill all-year-round, skip ahead. For those of you who find yourselves enjoying a winter wonderland outside stuck in the snow like me, a tip on roasting chicken: Preheat oven to 350 degrees. Prepare a baking sheet by lining it with aluminum foil. Place chicken breasts on foil, drizzle both sides with a little olive oil - rub around to coat - and sprinkle with salt and fresh cracked black pepper. Roast for 20-30 minutes, or until the juices are no longer pink. Exact roasting time will depend on size of the chicken breasts. Check after 20 minutes and go from there. No dried out over-cooked chicken here. I wouldn't be exaggerating by telling you I prefer roasted over grilled chicken. Grilled chicken almost always gets too dried out from over-cooking it seems. Roasted chicken, however, is extra juicy and delicious. Step Two: Dice, mince and chop the strawberry, red onion and serrano/jalapeno chili. Combine in a medium bowl and drizzle with lime juice and a sprinkling of kosher salt. Now WAIT! 15 more minutes to let the flavors meld together before this spring salsa is ready to eat. If you are roasting chicken or cooking fish, now is the time. *NOTE: Substitute a jalapeno if you can't find a smaller serrano chili. Keep in mind that a jalapeno with seeds will be bigger and spicier than a serrano, so depending how much heat you like, you may want to remove some seeds, or only use 1/2-3/4 of the chopped jalapeno. You could also add some cilantro if you have any laying around. Dice, mince and chop strawberries, red onion and serrano chili. Combine in a medium bowl and drizzle with juice from 1/2 a lime. Sprinkle with kosher salt, stir, and allow to sit for at least 15 minutes prior to serving. Do you have a favorite fruit-inspired meal? Living in the midwest, I came to realize at a relatively young age, that the majority of meat available in this part of the country, with good quality, usually begins its life with two-four legs. Sorry for the picture-painting all my vegetarian and vegan followers! Anyways...my point is, if you live in America's heartland, aka all of the landlocked states without at least one border on an ocean, finding anything on your plate that has fins, came out of a shell, or is a portion of a tentacle, is very uncommon. To all of you middle America fisherman out there - I'm not knocking the freshwater fish - I've definitely enjoyed my share of fresh-caught walleye and northern. That being said, it gets cold here, which means the ice freezes, and once again I find the dilemma of no fresh fish available. I can't begin to tell you the number of times I've tried to buy fresh fish out of the meat counter, or even frozen, and got it home just to be disappointed by the strong fishy taste of a fish that has been out of water for just a little too long. Do you know what I mean? On a side note: If you do live in the midwest, and enjoy eating what you catch, make sure you are aware of any EPA advisories for the lakes or streams you are fishing. Nothing worse than finding out the dinner you just ate was laden with chemicals unsafe for human consumption. You can check your fishing spots using this interactive FISHING ADVISORY MAP provided by the EPA. Anyways...back to my saga. So I am a fan of most seafood (Except salmon. Don't really like salmon - it's just too fishy for me). I just don't have any luck with it where I live. Unless fish sticks count, I rarely venture into cooking with fish, because I've been let down by it so many times. However...when I saw this recipe for creamy parmesan orzo with bay scallops & asparagus, I decided to give it another go. I'm so glad I did. I did have to buy frozen bay scallops (surprise surprise, I couldn't get them fresh where I live), but the flavor did not dissapoint. I waited to purchase them the same day I was making this meal to make sure they would be the most fresh, frozen, scallops I could get my hands on. Asparagus prices were finally less than $5 per bunch like they've been most of the winter, and I wanted to try cooking with orzo - a little rice shaped pasta. I will say one of the main bonus points this recipe gets - besides being super quick and easy to get on the table - is that the ingredient list is very small, and doesn't take very long to put together. I hope you enjoy it as much as T & I! BEFORE YOU START - read through the directions! This is a fast recipe, and you'll want to time it right so the different components are completed at the correct time. Rinse scallops and pat dry. Set aside. Dice onion. Melt 1 Tbsp butter in a large skillet over medium heat. Add diced onion, and sauté, stirring occasionally, 4-5 minutes until translucent. While the onions are sautéing, bring a large saucepan 3/4 filled with water to a boil. Add orzo and cook 5 minutes, stirring occasionally. Meanwhile, cut the asparagus into 1-inch pieces, and don't forget to stir those onions! After 5 minutes, remove onions from the skillet to a warm dinner plate, and set aside. Add the cut asparagus to the saucepan with orzo, and boil an additional 5 minutes, until tender. *NOTE: If you have excess liquid from cooking the scallops, drain them off before transferring to the plate with onions. Once the orzo and asparagus are cooked, drain, and transfer to a large warmed serving bowl. Quickly add the remaining 2 Tbsp butter, and 3/4 C parmesan cheese. Stir well to combine. Slowly add the cream, stir. Add the sauteed onions, scallops and fresh parsley. Mix well. Season with kosher salt and pepper, garnish with additional parmesan and parsley. Serve immediately. *A quick and easy way to warm the dinner plate for onions and scallops, and serving bowl, are to pop them in the microwave for a couple of minutes. This will help to keep your meal nice and warm. What are your favorite seafood recipes? On occasion, I find that I have an abundance of ripe bananas on my counter. Have you ever been there? At the beginning of the week I usually pick up a bunch of bananas at the store full of good intentions. Bananas are definitely my go-to fruit of choice. They are relatively inexpensive, easy to grab-and-go, don't have to be refrigerated, and are nice and soft. If you have sensitive teeth, you know the dilemma. Apples are tasty, but not so fun to bite into, grapes are delicious, except I don't like the cold on my teeth, and oranges are just, well...a pain in the pa-toot if you know what I mean. Anyways...I'm always on the lookout for the next great banana bread recipe. When I came across this one that calls for shredded coconut, I knew I had to give it a try. The added sweetness from the shredded coconut and coconut milk make this bread a real treat. It could easily be served for breakfast, and afternoon snack, or if you're like me, maybe with some frozen yogurt as a light after-dinner dessert. Step Two: Mix together the sugar, oil, eggs, vanilla and almond extracts in the bowl of a stand mixer. In a separate bowl, mix together the coconut milk and mashed bananas. In yet another bowl, mix together the flour, baking soda, baking powder and salt. Step Three: Alternately add the dry and wet ingredients to the bowl of a stand mixer with the mixing speed set on low. Finally, add the shredded coconut, stirring well to combine. Transfer to lightly greased loaf pan(s). Step Four: Preheat the oven to 350 degrees, and bake for 40-45 minutes if using mini loaf pans, or 1 hour - 1 hour 15 min if using a 9x5 inch loaf pan. Allow to cool completely before serving. COCONUT BANANA BREAD | Yield: 4 mini loaves or 1 large loaf | Total Time: 1-1.5 hrs. Preheat the oven to 350 degrees. Lightly grease a 9x5 loaf pan, or 4 mini loaf pans. In the bowl of a stand mixer, combine oil, sugar and eggs. Beat until well combined. Mix in the vanilla and almond extract. Mash the bananas in another bowl, add in the coconut milk, and stir to combine. With the stand mixer on low setting, alternately add the wet and dry ingredients, mixing until just combined. Finally, mix in the shredded coconut. Pour the batter into the loaf pan(s). Bake for 1 hour -1 hour 15 min. if using a 9x5 loaf pan, or about 40-45 minutes if using mini loaf pans. Allow the bread to cool for 10 minutes in the pan(s), then transfer to a cooling rack to cool completely before serving. Do you have a favorite recipe that uses ripe bananas?